Catch Reed and Riley Stephens on the wrong day and it would be easy to assume the Metairie-born, Mandeville-raised brothers have a comically severe loathing for watches. An objective onlooker would see them slamming timepieces into freezers, hitting them aggressively with random objects and dropping them from great heights anywhere and everywhere they go. They even placed a watch right next to a gas grill once and fired up the burners with glee. Durability is one prong of the personality the Stephens brothers want imbued in each of their creations for Ambici Wooden Watches, the company the duo launched while they were still teenagers. The other is uniqueness. One rarity of the Stephens’ business is their youth. Now 22, Reed is a mechanical engineering grad from LSU working on his MBA at Tulane. At 20, his partner Riley remains a Tiger, studying computer science in Baton Rouge. Both work nights and weekends on designs and concepts for their growing brand. Each of the four watches in Ambici’s Original Collection, equipped with all-natural wood, stainless steel, sapphire crystal and Japanese quartz movement, retails for $129. Four years in, the brothers say Ambici is ready to expand its slate. They have initial designs ready for sunglasses and other men’s accessories. Often beginning with just pencil and paper, the brothers put their computer science and engineering skills to use, turning their loose sketches into complex digital 3D models and sending those models and schematics to their partners in Shenzhen — China’s skilled manufacturing hub. There, ebony and sandalwood sourced ethically from Africa and Brazil are cut and engineered with the metal and quartz mechanics and molds of each timepiece. Reed and Riley receive their finished watches by delivery and divide all inventory, sales and marketing duties among themselves. “The most fulfilling part is getting that box with the watch back for the first time,” Reed says. 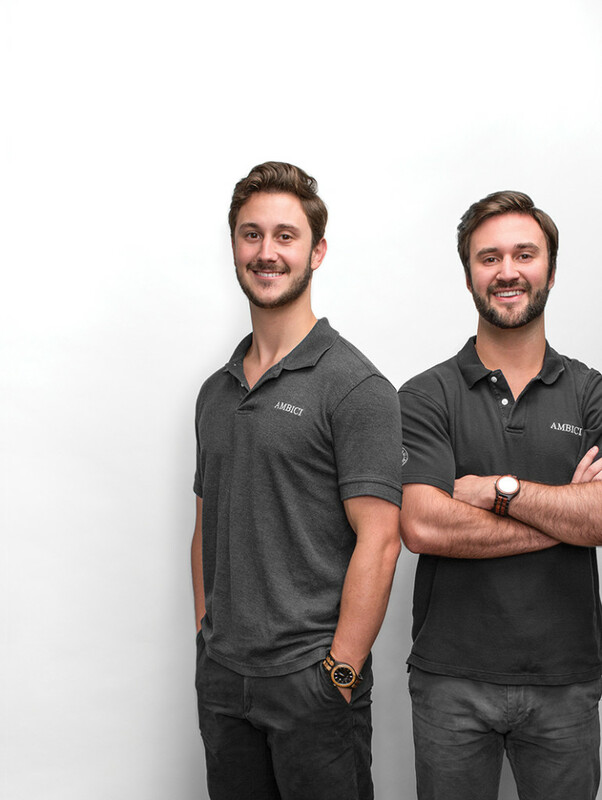 The duo has had interns for social media, but for the most part, theirs is a two-man operation. And that’s how they like it. The eldest of five, the precocious brothers have been collaborating their whole lives. One year they saved up allowance money and bought a wood engraver to cut simple, holiday-themed designs to sell to family and friends. With verve and organization worthy of a Wes Anderson movie, hanging on their bedroom wall was a clipboard with a chart listing their products, material costs, sales figures and other entrepreneurial details. They were aged 11 and 9, respectively. Reed’s earliest memory is meticulously carving a toy airplane with his dad, and after coming across a wooden watch design in a magazine, Reed and Riley were inspired by the look that recalled the afternoons of their youth spent in their father’s backyard workshop. Soon they pooled their money and fashioned their own prototype watch. “Making that one watch cost five times what I was worth at the time,” Reed says. “I couldn’t even drive!” Riley says. Needing funding, they launched a successful Kickstarter campaign, and in 2014 Ambici was born. Albanian for “ambition,” the name suits the Stephens brothers like a glove. Or a great-fitting watch. Watches often tell a story. If you could pick actors to play yourselves in your story, in a movie, who would you choose, and why? Reed: Leonardo DiCaprio, because aside from his acting capabilities, he uses his influence to do great work — such as pushing everyone to be more eco-friendly and environmentally conscious. Riley: Robert Downey Jr. because not only is he an incredible actor, but he has a very inspiring back story of overcoming obstacles that I think any entrepreneur would appreciate and can learn from. You started making things and testing out businesses when you were pretty young. How has being raised in Louisiana influenced or inspired you as watch designers and entrepreneurs? Riley: Louisiana has a really strong cultural presence that allows you to draw on that creativity for your work. There is also a strong sense of community here. Everyone we meet is always very willing to help us in any way they can. What Louisiana-specific woods do you want to get into using in the future? Reed: Louisiana has some great live oaks, like the ones around LSU’s campus, and I think using recycled or reclaimed bald cypress would be a great tribute to Louisiana and really hit home for people from Louisiana. Developing that is what’s next for us along with some ideas we are working on for designing other accessories.